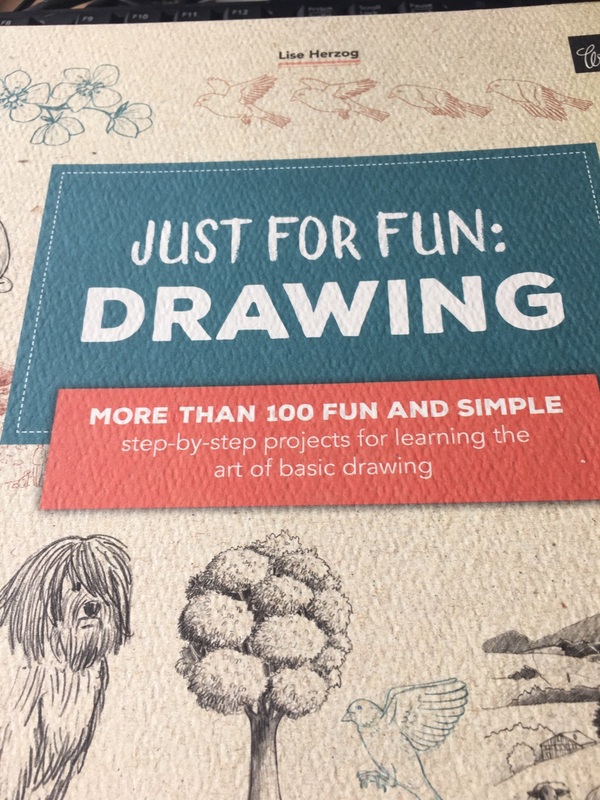 With Just for Fun: Drawing, aspiring artists and art enthusiasts who have never before picked up a pencil can follow simple step-by-step instructions and discover how to draw everyday subjects. Each featured subject starts with basic lines and shapes, and slowly progresses with each new step to a fully rendered, completed drawing. Saving the nitty-gritty technical aspects of drawing for the more advanced student, Just for Fun: Drawing simply touches upon key drawing concepts and fundamentals, including perspective, proportion, volume, shading, and composition, among others, that are relevant to a beginner’s core understanding of the craft. With its abundance of approachable and contemporary drawings, as well as loads of tips, instruction, and inspiration, Just for Fun: Drawing will have even the most artistically challenged individuals mastering the art of pencil drawing in no time. 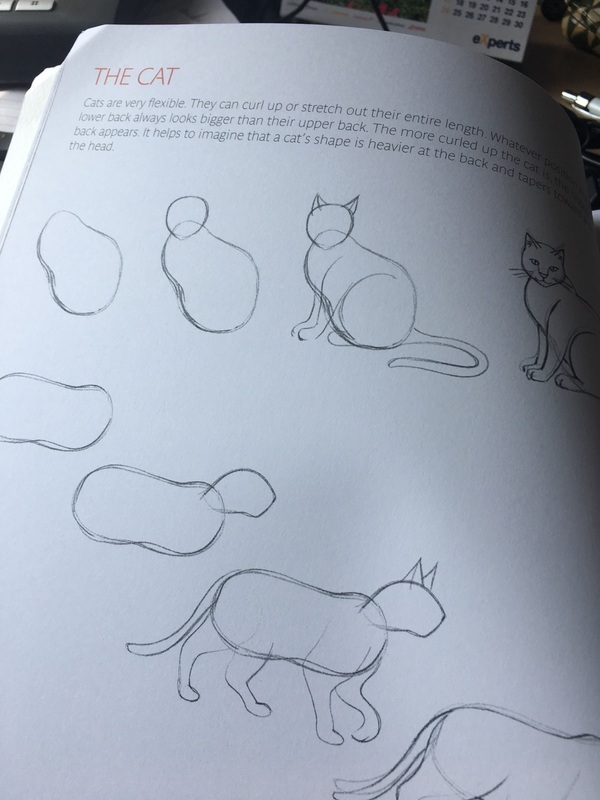 Have you ever wanted to learn how to draw? I didn’t think I could draw very good but with Just For Fun: Drawing I can! This book gives you step-by-step instructions that anyone can follow. I love that it starts out really basic and by the time you are done you have completed an object. 4 or 5 steps and you have a cat as pictured above! In Just For Fun: Drawing you can learn how to draw animals, faces, trees and much more. It has nice detailed instructions and is great for the beginner. I can see an improvement too in my drawing from when I first started. It’s lots of fun! You can purchase your own copy of Just For Fun: Drawing below. My job this year has been very stressful so I am looking for ways to let my creative side shine! I really enjoy drawing and coloring. It reminds me of when I was in school and we had a sketch pad we had to draw in for class each week. Here is one of the newest books I have called – Anywhere, Anytime Art. Anywhere, Anytime Art: Crayon allows artists of all skill levels to create beautiful, spontaneous artwork inspired by their surroundings, no matter where they are! Discover how to work with crayon, master basic strokes and drawing techniques, and choose the right colors for your subjects. Fun and simple step-by-step projects teach you how to create your own contemporary works of art using crayons. What I like the most is all the helpful tips through out the book. 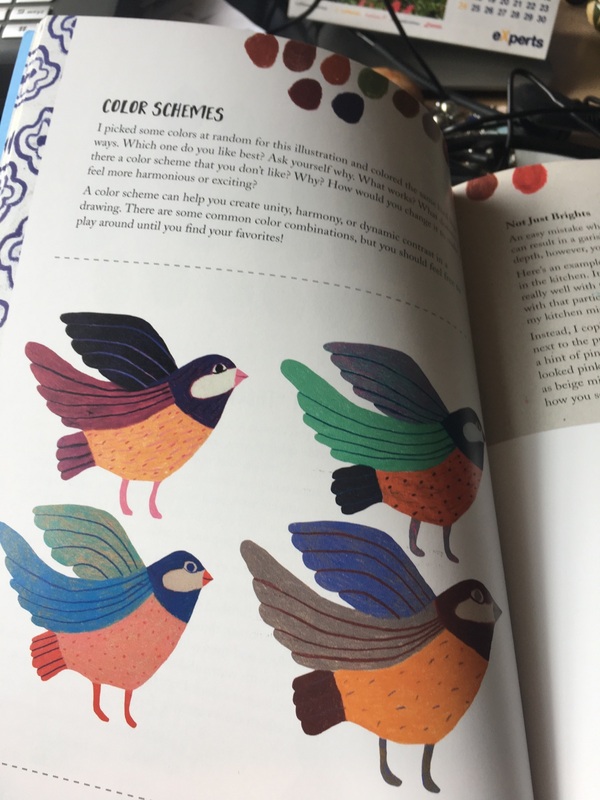 Here on this page it talks about color schemes. It suggest color four items the same way but use different colors to see what you like the best. 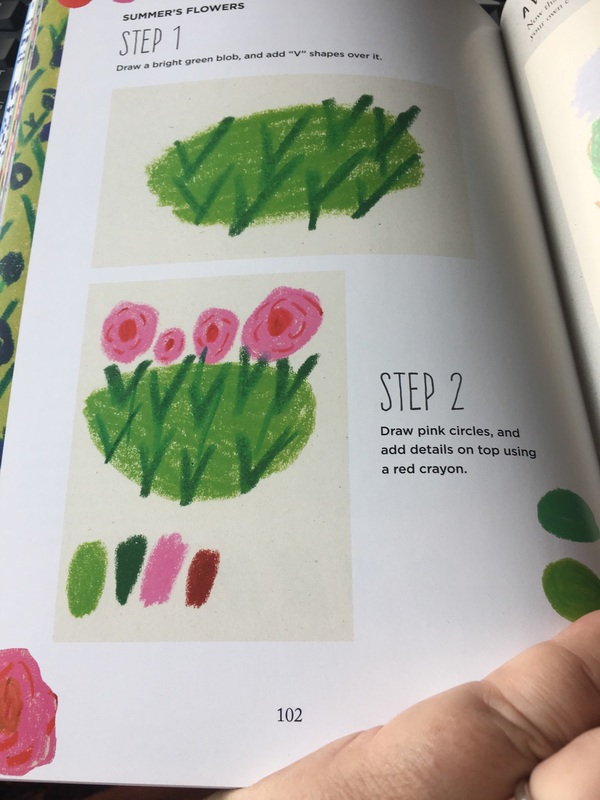 Here is a simple way to draw summer flowers – that look great! You can add this to a picture of a garden, park or house and it would add a lot. I am learning a lot by using this book and love all the helpful tips. 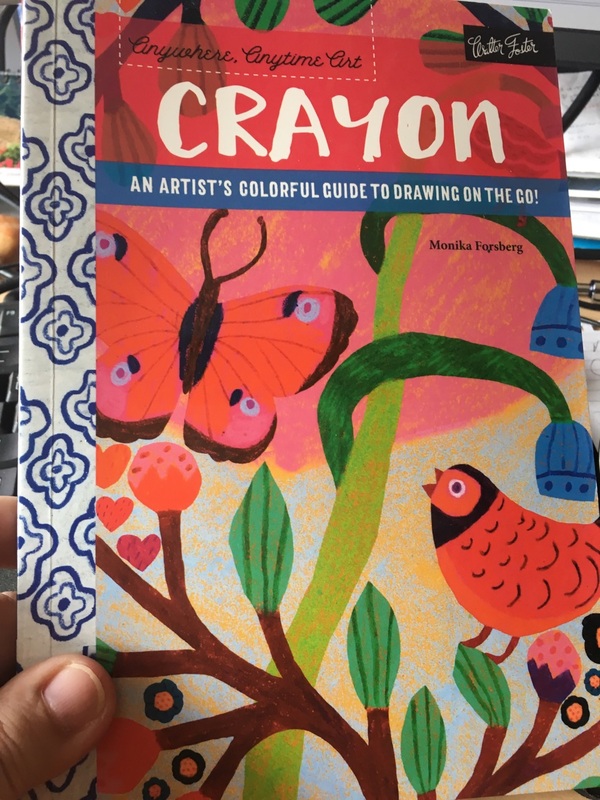 This book is great for anyone trying to be a bit more creative. This is a fun way to work away some of the stress you may have. You can find this book below on Amazon. When it comes to creating beautiful, handwritten letters we always admire calligraphy as a symbol of romance, charm, and skill. These iconic letters showcase the individuality of the sender and are kept as treasured keepsakes for decades. And with the evolution of these gorgeous flourishes– creative lettering is more popular today than ever, with hundreds of inventive souls embracing this artistic niche. Brush pen lettering has taken over calligraphy art with it’s more nuanced ways of adding color, shape, and design. In a world gone digital, lettering provides the perfect hand-drawn, organic element to any design, whether it be snail mail, a company logo, or custom wedding invitations. 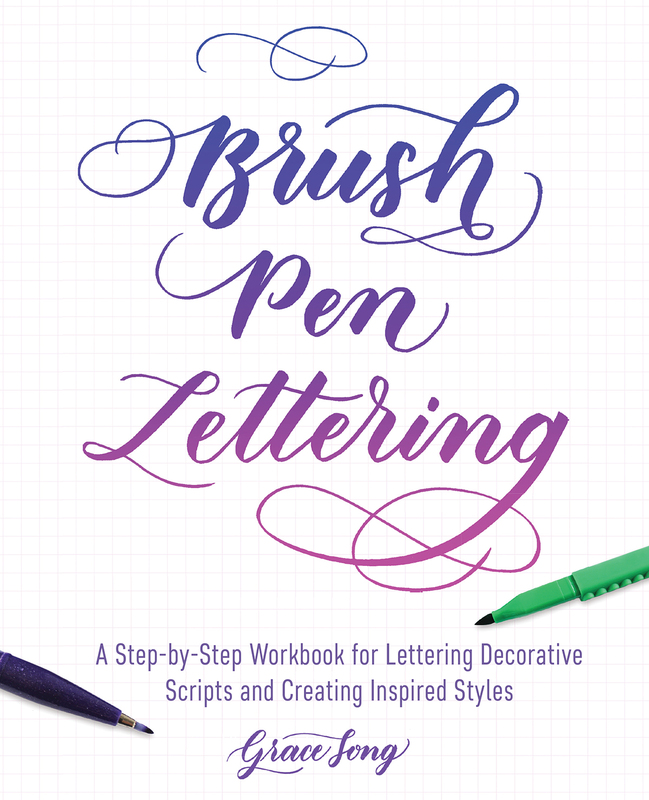 With Brush Pen Lettering, readers of all skill levels will experience the creative facets of lettering with this informative, easy-to-use guide. Readers will learn the fundamental practices of brush pen lettering, from what type of brush to use- to the position you hold your body and paper, from wrist and whole arm movement- to the different small pressures that develop the gorgeous designs of brush pen lettering. Author Grace Song, is a self-taught brush pen calligraphy artist who creates dynamic, hand lettered pieces with a variety of tools, including brush pens, watercolors, and paintbrushes. Her many followers admirer her beautiful designs, each of which highlights Song’s technique and style. Brush Pen Lettering is an easy to read and practices writing beautiful lettering. It takes you step by step through how to make your letters more decorative. Through out the book you will find drills to help make your lettering more interesting. 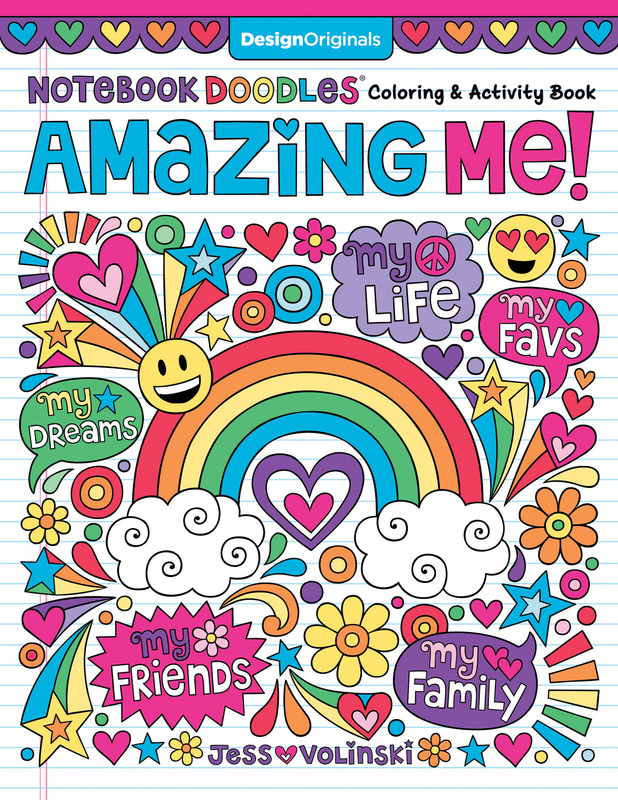 I think it is a great book for beginners and love the variety of designs. I am someone who loves to doodle and practice drawing and writing all the time. To me it is very relaxing. I like to schedule a time a couple days a week where I can be creative. Grace has included guide practices sheets along with lots of tips through out the book. If you practices you will be a pro within no time! You can purchase this book from Amazon below. Going to the fair was always a big part of my summer growing up. I was in 4-H and always baked, knitted and even did woodworking projects. My Dad was a judge for the woodworking section so we would spend a couple days at the Seymour Wisconsin Fair. I remember going on the rides and of course trying all the great food! Rex and I are going to the fair this weekend and I can’t wait. 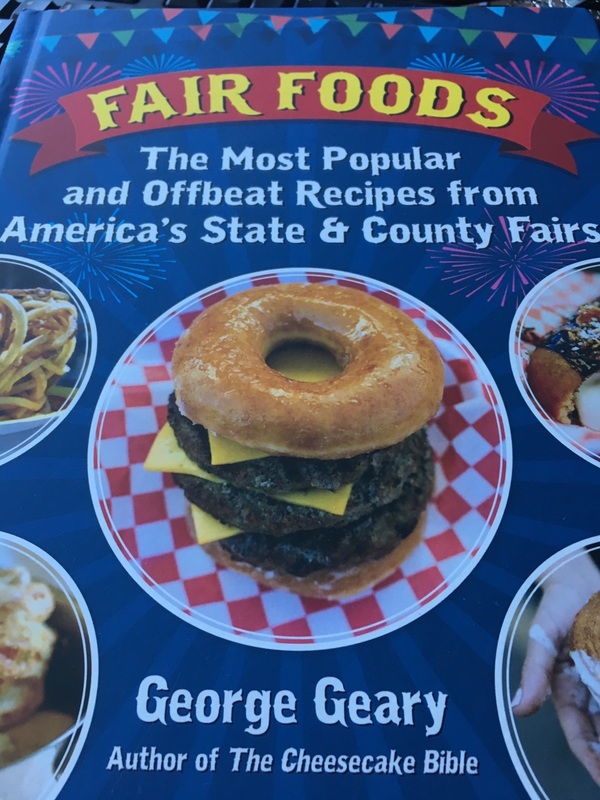 Here is a fun cookbook – Fair foods – The most Popular and Off Beat Recipes from America’s State & County Fairs. Packed with 120 original recipes created by award-winning chef, best-selling author, and renowned educator George Geary, Fair Foods includes such state and county fair classics as Texas Maple Bacon Donuts, The World’s Gooiest Cinnamon Rolls with Cream Cheese Frosting, Aztec Hot Chocolate, Witch’s Brew, Caramel Kettle Corn, Fried Sweet Potato Sticks, Ten-Pound Cheesebuns, Cheesecake on a Stick, Chocolate-Encased Bacon, Fried Coca-Cola, Fried Guacamole, Fried Oreo Cookies, BBQ Turkey Legs, Bacon-Wrapped Chicken and Waffles, Blue Ribbon Chili, Pork Chop on a Stick, and Spicy Peanut Butter and Jelly Burgers. Each page in Fair Foods is lavishly illustrated with both vintage and contemporary photographs of America’s most beloved fair foods, as well as fun and lively images of rides and attractions and nostalgic ephemera. Fair Foods is not only mouthwateringly addictive, it also captures the joy and spirit of America’s greatest state and county fairs. George Geary is an award-winning chef, best-selling author, and renowned educator. A former pastry chef for the Walt Disney Company, Geary is a Certified Culinary Professional, and was recently chosen as the Culinary Educator of the Year by the International Association of Culinary Professionals. He is perhaps best known for creating all of the cheesecakes for The Golden Girls and other top-rated television programs. Geary has worked as a critic and/or judge for ABC’s The Taste with Anthony Bourdain, The American Baking Competition with Jeff Foxworthy, Hell’s Kitchen, Supermarket Superstar, and many other popular television shows. He also teaches cooking classes aboard Holland America Lines. For over thirty years, Geary has been a culinary contest judge for major food manufacturers such as Canola Producers, Veg-All, Hormel Foods, the Hershey Company, Knott’s Berry Farm Foods, Ghirardelli Chocolate, Fleischmann’s Yeast, the San Diego Union Tribune, ABC News, and many more. From 1982 to 2010, George was the culinary coordinator of the Los Angeles County Fair. Geary is the author of L.A.’s Legendary Restaurants, as well as nine cookbooks including The Cheesecake Bible, The Complete Baking Cookbook, and 125 Best Cheesecake Recipes. He is presently the featured chef on the San Diego Living television show on the CW Network. Geary lives in Los Angeles. I am sure you will find lots of good recipes that you will want to try. I can’t decide if I want to make some Frozen Cheesecake on a Stick or maybe some Fried Guacamole Bites. What would you try? You can purchase your book below from Amazon. Do you remember the days when your dog eagerly jumped up to greet you each time you walked through the door? Fido may now raise his head and go right back to sleep. Though you may assume that your dog is just getting older, a lack of activity can be a sign of a dog suffering from pain or poor health. Dogs that are less active can gain more weigh, which increases their risks of developing common medical conditions like diabetes and arthritis too. There are some easy ways you can improve the health of your dog though. The best way to improve the health of your dog is with some daily exercise. You cannot expect your dog to stay inside all day long without noticing some problems in the future. Even the smallest of dogs need some regular exercise. If you have a fenced in yard, you can let your dog play outside for around an hour, but you’ll want to make sure that you leave out plenty of water, especially on hot days. Try taking your dog for walks daily and giving your pets some toys to play with too. Making some changes to your dog’s diet can also help improve its health. While some pet owners swear by natural diets that include foods they make for their dogs like scrambled eggs mixed with fresh vegetables or steak and chicken, you can find healthy food in the grocery store as well as in pet stores. These foods contain real ingredients that you can see each time you feed your dog. Make sure that you follow feeding guidelines too. Feeding your dog too much or too little can significantly affect its overall health. Giving your dog a natural supplement once a day can help too. Dog glucosamine is an ingredient found in many supplements that can help relieve pressure on the joints that cause aches and pains. If your dog has trouble walking, laying or sitting because of joint pain, these supplements can help. The best supplements will contain other vitamins and minerals too. You may want to talk with your veterinarian to avoid any negative interactions with the medicines your dog already takes. Using supplements, making diet changes and getting your pet more active can all significantly improve your dog’s health. Perhaps the most difficult concept to grasp and understand is the need to forgive those who have wronged us. It is extremely difficult not to use prior abuse as an excuse for our shortcomings today. Most people believe that forgiveness lets the perpetrator off the hook. In a divine sense, the very opposite is true. When we forgive others for past transgressions we are somehow able to steady ourselves and move on with our lives. The release of the past somehow graciously releases us and puts our lives back into our own hands. Many people have had a challenging past. This truism is well known to everyone. However, this truth applies to many groups for many different reasons. One central truth is that there have been struggles based purely on race, disability, sexual orientation and economic status, to name a few. Many groups have suffered abuse and disenfranchisement for many reasons, both present, and past. Some might say that they didn’t deserve what happened to them. Some could also say that based upon what has happened it is impossible to move forward and take full responsibility for their own lives. However, none of this is true. On some level, we all know this. It is a well-known fact that life is not fair and that innocent, undeserving people are hurt all the time. The son of an alcoholic father who was abused can still grow up and not abuse alcohol or his children. This is true although he was abused and did not deserve it. It’s clear that the innocent suffer all the time. However, it’s not enough to feel sorry for ourselves and not take responsibility for our own lives and dreams. Despite any abuse or wrongdoing past or present, we are still responsible for our own lives. This fact is not partial to anyone. We all have a responsibility to take control of our own lives regardless of color, socioeconomic status, disability and past hurts and disappointments. Nothing lets us off the hook. We must own our own lives regardless of what circumstances we come from. Ownership is equal to responsibility. Blame, quite simply put, is a lack of ownership. If you don’t own something you can’t control it. You are powerless in terms of control. Blame is the act of making other people responsible for your life. It is equal to giving other people control of your life. This concept can be true regardless of who or what situation we choose to blame for our current situation. You are powerless until you put the saddle back on your own horse and become responsible for your own life. We must understand that taking responsibility for our own lives is actually a gift. The choice and ability to steer puts everything back in your hands. You get to build the life that you truly want. Who else knows and cares for you more than you do? No one. You are the only person worthy of steering your ship, so why put this precious gift in the hands of people, places, and things by blaming people, past or current situations, or things? Once we truly realize what blame is there is no way we will want anything to do with such a self-defeating process. The beauty of responsibility and acceptance is choice. Choice is tantamount to freedom. What could be better than freedom? The ability to decide what we are going to do with our lives at every street and juncture is truly a gift. Acceptance and responsibility releases us from waiting on people, places, and things to change our lot in life. When we carry our own load by choosing personal responsibility instead of blame we are held back by nothing but ourselves. We refuse to let any circumstance or person determine our next decision by stopping to throw a pity party for ourselves or by playing the blame game. Our fear from a past trauma should not lead us to wear a concealment shirt all the time. The inward battle to take back your life is just the beginning of living a purposeful life. Personal responsibility creates a better world. What you practice you teach. Children learn personal responsibility from parents who practice this moral characteristic. Children also learn from what they see, not what you say. The practice of personal responsibility helps to build a generation of more mindful, self-aware, self self-led individuals. Slavery was an institution that lasted 245 years in North America. However, despite the horrific atrocities that were a part of slavery and its’ aftermath, we must go on. We must forge ahead and continue to create a beautiful tomorrow in addition to recognizing the strides that have been made in the wake of the oppression of many different peoples. We owe it to ourselves as a collective people of America. We owe it to themselves to overcome, move on, and transcend the stigma of oppression for future generations as well as present generations. Freedom is granted by taking steps necessary to transcend the awful historical events of the past and step into a brighter tomorrow by choosing not to blame; by mastering our thoughts. Our thoughts become our deeds and our deeds become our way of life. The releasing of blame sets us free to live the life we truly deserve. Personal responsibility helps us to create authentic lives that reflect who we truly are. After you have been arrested and sentenced for driving under the influence of drugs or alcohol, you may be given a chance to rehabilitate yourself and your behavior. As long as you satisfy the requirements of the court, you may have your sentence reduced or eliminated entirely. Your driving record may also be expunged to conceal your crime. When you want to satisfy these requirements but lack the time to take an on-campus class, you may wonder how you can fit this instruction into your busy schedule. You may comply fully with the court’s orders by enrolling in virtual classes, a DWI education program online, or other distance learning opportunities available to you. When you visit the institute’s website, you can find a full list of classes that typically satisfy the requirements laid out by most court systems. The classes cover a host of topics but primarily aim to teach you how drinking affects your ability to drive safely. Along with that particular topic, you also will learn information like how alcohol and drugs impair your ability to think clearly and make good decisions. You may be convinced of the perils of drunk driving and commit to avoiding this crime in the future. The courses also come with a certificate of completion that you can present to the judge, mediator, attorney, or another person overseeing your case and sentence. The class is designed to be comprehensive yet also timely so you can complete it in good time to reduce or eliminate your sentence. Despite needing this instruction, you still have to pay for it. The price of the class alone may be enough of a deterrent to convince you to avoid future DUI infractions. You can find the price for each class listed on the website. You can also find out about payment options if you cannot afford the price of the class upfront. Your receipt for enrolling in the class and paying the required tuition can also serve as proof that you complied with the orders of the court. Inebriated driving is a crime in all 50 states. Depending on the severity of your charge, you may be sentenced to taking online courses. You can comply with the judge’s orders and learn in depth why you should not drive drunk by choosing and paying for one of the classes on the website. One of my new favorite things to do is to color and to draw doodles. I find it really relaxing and takes me back to a simpler time. Here are a couple really cute new books from Fox Chapel. secret of happiness, with this lovely new coloring book for adults. Relax and feel your stress slip away as you focus your mind with creative coloring. Pronounced ‘hoo-guh,’ the Danish term hygge is all about basking in a mellow atmosphere and enjoying the good things in life with good people. 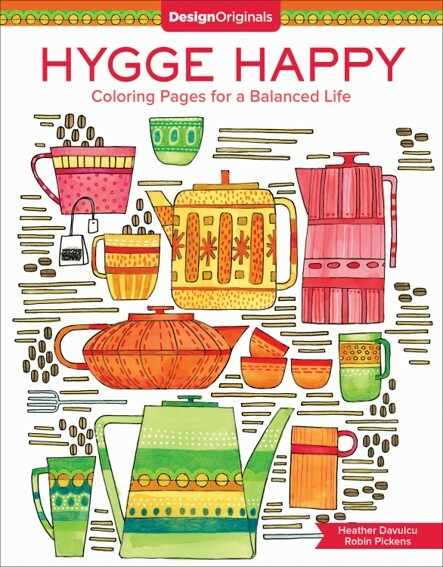 Hygge Happy Coloring Book is packed with classic hygge images of soothing baths, cozy armchairs, delicious snacks, fragrant flowers, warm sweaters, and more. Coloring is the perfect way to slow down, escape the world, and embrace the hygge lifestyle. Let’s get hygge happy! This book you can find HERE. Fair Trade Seal of Approval.